Ooma Office has added two new business phone products, and any employee dealing with a high volume of calls can benefit from the power, speed, and ease of managing calls with the new devices. The Yealink T27G IP Phone and the Yealink EXP20 Expansion Module provide full access to Ooma’s communications features and are a great choice for anyone who manages a high volume of calls, such as receptionists, executive assistants, or executives. In addition, the devices may solve some of the business communications problems that affect your office. Find out how using these Yealink phone devices with Ooma’s award-winning business phone service can help your staff members do their jobs better and improve your customer service. Your company’s receptionist may be jumping through hoops when transferring calls by pressing a sequence of buttons and extension numbers, likely consulting a printed staff directory with extension numbers during the process. This isn’t an efficient system, obviously. 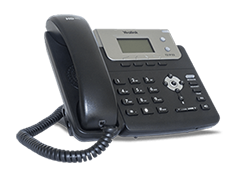 The Yealink T27G IP Phone is an excellent tool for managing multiple phone lines. It has eight programmable buttons that provide one-touch access to advanced calling functions such as speed dial, new line, call transfer, and call park. In total, each phone can accommodate up to six lines, up to three call park functions, and unlimited speed dial functions. Do you want even more capacity? The phone’s additional virtual pages let you cycle through menu screens so you can have up to 21 programmable buttons (seven buttons per page for three pages). The feature automatically turns on when more than eight buttons are configured. A desk phone that doesn’t have a full screen can leave your staff flying blind when making call transfers. Creative users will rig up sticky notes so they know which button corresponds to which extension. While there’s nothing wrong with the DIY approach, it can be improved through the 3.66-inch backlit LCD screen with full graphical capabilities offered by the Yealink T27G. Customizable digital button labels display the information that you enter when configuring your presets. The digital display will automatically update when you make changes, and when this information is readily available, staff can be more efficient in how they transfer calls. Like a booster pack to an already powerful rocket, the Yealink EXP20 Expansion Module expands your phone’s capability, making it easy to manage calls across a wider set of employees. High-volume phone traffic positions such as receptionists or administrative assistants can be the funnel point that bridges your business’ many callers with its large staff. A limited set of tools can slow down the exchanges that happen in this role. With the Yealink EXP20, your power users will have 20 additional physical buttons at their fingertips, offering one-touch access to essential functions such as call forwarding, speed dial, and hold. With a backlit screen and dual-color LED keys, the 60 x 320-pixel display is legible even in low-light conditions. Keep in mind that the EXP20 isn’t a standalone unit, and it must be physically connected to a Yealink T27G IP Phone to operate. Up to six EXP20 expansion modules can be paired with the T27G desk phone. Two expansion units can be powered by plugging them directly into the phone. For three or more expansion modules, an additional power supply is required. When the process of customizing your phone is archaic or frustrating, users are often less likely to take full advantage of the phone’s available functionality. However, when using these Yealink devices with Ooma Office phone service, configuring your devices is as easy as updating an online contact list. To set up the phone extensions and custom buttons on your devices, simply use your computer or mobile device to log into the newly designed Ooma Office Manager . From here, you can access administrative tools and configure your optimal phone system. Configure the first two to three buttons as “lines” for making/receiving calls. If you have more than two or three simultaneous calls regularly, consider more lines. Configure two to three “Call Park” buttons on each phone across a small company or department. For anyone who needs more than six speed-dial buttons, add the EXP20 Expansion Module hardware to the phone. While these Yealink devices may seem to give your receptionist ninja-like phone management powers, the tools can also be a strong preventative measure for keeping clients and customers happy. Consider how an incoming caller’s overall opinion of your business might be affected if a call is dropped during a transfer, if he or she is routed to the wrong extension, or if the process takes too long. When a receptionist has the telephone tools available to provide better call management, you might find that both your staff and customers are more satisfied. Note that when using Ooma Office phone service, the Yealink T27G and EXP20 are the only devices on which programmable buttons can be configured. The additional functionality available with the Yealink T27G and EXP20 is only available for customers on the current pricing model. 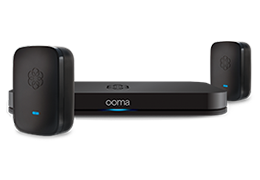 Ooma Office customers with legacy pricing plans can contact the Ooma sales team to discuss options for accessing this advanced functionality. Find out more about how the Yealink T27G IP Phone and the Yealink EXP20 Expansion Module can improve business productivity.